If you want to enjoy fishing in Tamriel, you will find plenty of opportunities to do so and also benefit from its advantages. Some players just find fishing a fun reward in itself, or enjoy it as a relaxing break from battling, however fishing has other rewards. So you found a provisioning (cooking) recipe that requires fish – what do you do? Well, you could buy fish from a vendor, but you could just go fishing for yourself for free! By fishing, besides being able to eat some fish raw, you can use various fishing reagents in some of your provisioning (cooking) recipes, you or you may need fish for some of your alchemy potions; and additionally you can even sell extra fish for gold. For example, Green/Blue fish can have a vendor value of upwards of 130 gold coins! So how do you get started fishing in ESO? Well, that is what this Fishing Guide will help you do. The first good news is that as soon as you start out your game, and pick fishing as a skill that you want to try; you will get a starter fishing pole! As you will soon further discover; Fishing in ESO is not only fun, it is a Skill that benefits you socially, benefits your other professions (such as crafting potions in Alchemy and cooking in provisioning), can earn you gold if you sell some of your fish, and can help you get rare surprises and special achievements. Further, every time you catch a fish you will also gain experience that increases your proficiency in the fishing skill. As you practice and progress you will get quicker and better at fishing and your rewards will get better too as you improve, like in other crafting professions. You may even get lucky and come across rare or special fishing poles in your game, which you like even better than your starter fishing pole. As you gain in experience and skill, some bait may even need to be fished up to be used to catch other more valuable or rare fish. 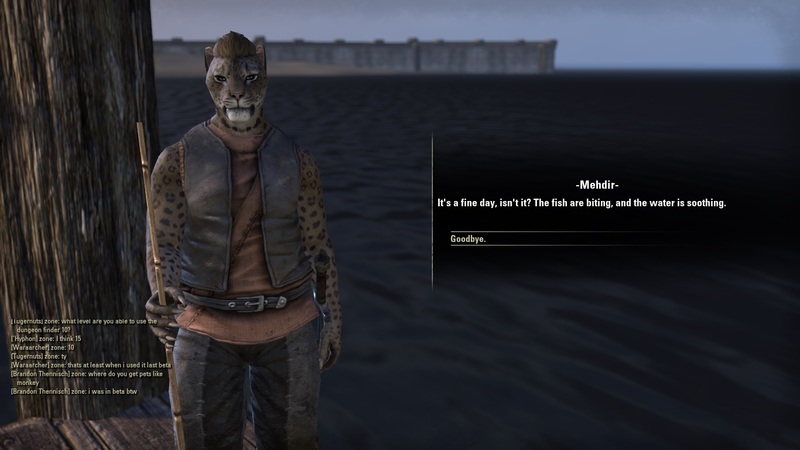 Its awesome fishing adventuring to have rare fish in ESO that you need to find books and/or lore in the world that hints at where and how to catch them, instead of only random rare fish here or there; which are also there for surprises. For those that like a real fishing challenge; to get the Meta Fishing Achievement, the main zones have 12 rare fish each to catch! Beginners luck can be fun in ESO Fishing too! Will you be a new player that gets lucky and catches that Blue Ebonheart Fish, (worth 140 gold) right off the bat? You never know! You can just fish for fun with your friends, or you can work your way up to becoming a Master Fisher! The choice is yours. Seeing Fishing Pole Racks means Fishing Holes are nearby where it will likely be safe to fish, even for rare fish. You can safely fish at town piers and by docks all over Tamriel, and you can also find fishing holes in your adventures, or chance upon them in your travels; or look for them where ever you find water out in the dangerous wilds too. If you are curious and/or brave there may be somewhat rare, hidden or secret fishing holes you may discover, where you have a chance to find rare fish or special fishing reagents. You may find even special books or quests in Tamriel that send you to offbeat locations with secretive fishing holes, with greater rewards. In the natural world, if you notice rippling and splashing in water, it could be fish splashing about. Likewise, the trick for knowing where to fish in any water in the ESO world of Tamriel is to look for where the water is splashing up. You can buy fishing bait from vendors, but even Simple Bait can cost up to 15 gold coins from general merchants, so let’s look at free ways to get you your fishing bait too. A great free way to get fishing bait is to kill rats for guts, spiders for crawlers, and other small level-1 pests and critters that will have guts or innards that are harvestable for bait. Harvesting Insect Parts from Butterflies or Torch Bugs can glean you some free bait too. You can carry a small amount of simple bait at the start (which can be used to fish anywhere), and easily harvest and gather the rest of the various types of bait during your adventures. Shad bait can be found in foul water; like Minnows for bait are caught fishing in oceans, and chub bait can be found in lakes. In general, you may want to try using Crawlers/Fish Roe for fishing in foul waters, try using Shad or using Insects or Insect Parts for fishing in rivers, try Chub for catching ocean fish, and try using Minnows and Guts for fishing in lakes – but you can experiment with various baits in various places and jot down your own findings. You can also get worms for free bait from harvesting plants -- such as jute you can find where you see purple flowers in the grass. For example, hover your mouse-curser over the purple flowers in the grass and if it says Jute, you can pick Jute there by pressing E on your keyboard. Besides, when you harvest Jute, you get raw jute for use in clothier crafting, and worms for use in fishing. A Win-Win situation! Don’t worry if at first you forget which key to push in harvesting, fishing etc., because the key you must push for an action will be displayed for you in a little box with the letter of the key to push. Remember one simple rule: You can find simple baits harvesting plants or killing different animals. If you are lucky you can discover an ingame book that tells you exactly which bait is best to use is for where and what -- to give you more precise targeted chances for whatever you want. However, as you progress in your fishing skill you may find better bait and lures; yet fear not, there is plenty of easily obtained bait that’s enticing to various fish with right from the start. So you have your starter fishing pole waiting to appear, you now have bait, and you know that you can find fishing holes or fishing spots most anywhere you can spot a little rippling and splashing in the water --- but how do you fish? Well, just hold your mouse curser/pointer over the water and where you espied a bit of splashing and you see the message ‘Fishing Hole’ and are offered the choice to fish by pushing the E key on your keyboard as displayed for you. Wallah! – Your Fishing Pole appears! It shows a fun animation of your player-character with your fishing pole and brings up a wheel-menu with all the different types of acceptable bait you have in your inventory, without you having to hunt and peck through your inventory to find your various baits one-by-one by name! It then gives you the option to choose which type of bait you want to use from this bait wheel menu. Select your bait, (use the one you have the most of or the one you think is best for that type of fishing hole) and it automatically attaches it for you, your line is now baited and you cast into the water. You will see a message saying ‘Real In’ displayed beneath the words ‘Fishing Hole’, press the key to reel in, when you feel something nibble like a little pull or tug on your fishing line. Wallah! An animation displays showing your catch being reeled in by your player character. Each time you cast your line to fish, you get a chance to choose your bait in case you want to switch it up, and explore your options more. You will also have a better chance of catching more fish per turn, and more valuable or rare fish, if you are socially fishing with other gamers who are fishing with you at the same spot! This is a nice feature, because instead of worrying that somebody that comes up to fish where you are already fishing might scare away your fish making you catch less – instead you will both improve each other’s odds by fishing together! So friendly fishing is mutually beneficial. So if you enjoy fishing, you may even want to start or join a Fishing Guild. We hope to see you by the water, having fun fishing with ESO Friends! I like this guide, well first of all because I like fishing in games :D But it also helps a lot to new players, explaining every step in fishing, how it works and how to get bait for fishing. Thanks for the guide. I had no idea you could get upgraded fishing poles. The bit about social fishing is really helpful too.